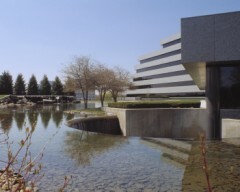 In 2005, LaSalle Bank Financial Center, Troy, Michigan, now Bank of America, was the first building in Michigan to achieve the coveted LEED-EB Gold Certification from the U.S. Green Building Council (USGBC). 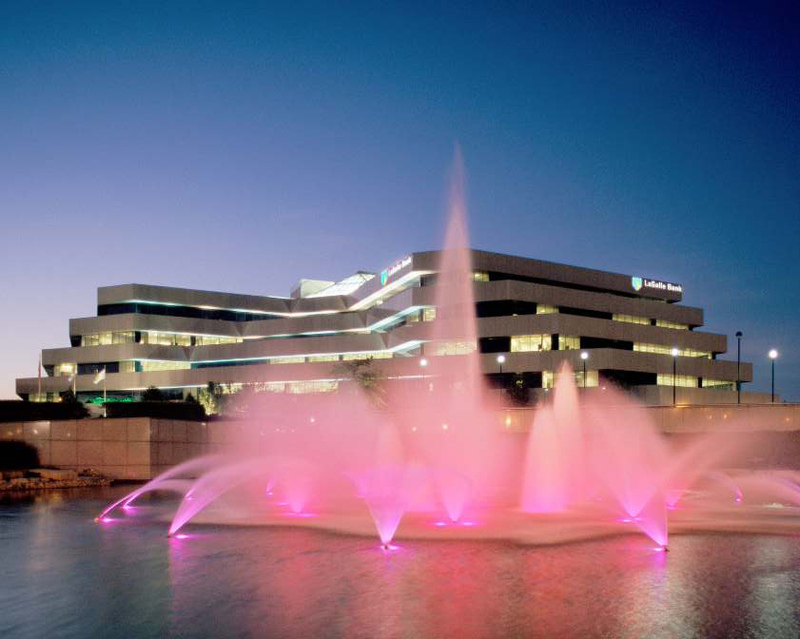 The building had previously earned TOBY Awards [The Office Building of the Year – presented by the Building Owners and Managers Association (BOMA)] in 2002 and 2005. Prior to construction in 1987-88, the original owners, Standard Federal Bank, wanted a high-quality environment for the building occupants while minimizing energy and operational costs. At the time, a BOMA study had indicated that a building’s HVAC system could improve employee productivity by more than 10% if it provided the proper environment. An ice storage system and centrifugal chillers that manufacture ice at night to reduce the daytime electric demand charges. Dedicated outdoor air handling units to reduce the amount of moisture the indoor units would have to remove from the air in the summertime. In 1991, the building won a first-place award from ASHRAE (American Society of Heating, Refrigerating and Air-Conditioning Engineers) for its minimal use of energy. At that time, 105,000 Btu/sq ft/year energy use in this type of building—a commercial office and data center—was considered extraordinary. Although designed far better than the standards of the late 1980s, as a building more than 25 years old it uses more energy than a well-designed modern building of the same type. New building standards and codes, new materials and types of construction, and new ways of thinking relative to energy and the environment to further minimize energy use. ABN AMRO, the parent company of LaSalle Bank, was committed to sustainable building practices to reduce their impact on the environment. Not only did they reduce the amount of natural resources they consumed and waste they produced, but they also stimulated responsible procurement, encouraging their suppliers to behave in a more sustainable way. The excellent operating and maintenance procedures put in place by Bob Deacon, JLL’s Chief Engineer for the building. Newman Consulting Group/Greenworks Studio was hired in late 2005 to facilitate the LEED-EB Certification and to help implement new policies and procedures to conserve energy. At that time, the final LEED-EB Guidelines were still in the pilot stage, and there were only a few LEED-EB Certified buildings in the country. Much of the emphasis in LEED for Existing Buildings is on green purchasing policies and proper operating and maintenance procedures. The building must also meet the prerequisites for consumption and the requirements for proper environmental control and minimal energy. Early on, it became apparent that a Silver Certification level was attainable. What was not apparent, however, was just how much more work it would take to attain the Gold level. Going for the gold required both major and minor adjustments. The most expensive was replacing the 20-year-old roof with a “green” roof. A considerable additional capital expenditure to be sure, but it came with many benefits. Some other actions, such as reducing energy use, tighter procurement policies, and changes to operating and maintenance (O&M) policies and additional O & M procedures were considered relative to their cost/benefit ratio, as well as their potential positive impact on the employees. These types of decisions continue to influence the different types of LEED certification. Lastly, LaSalle Bank Financial Center created a permanent exhibit in the building to showcase what can be done to preserve and sustain the environment in today’s buildings - and buildings of the future. This exhibit not only provides education and outreach to their employees and tenants, but it also reaches suppliers and the general community. An earlier version of this article first appeared in the Detroit BOMA Newsletter in May 2007. Jim Newman is one of the country’s most experienced energy efficiency and green building experts. Known as the “Dean of Green,” he regularly speaks to professionals, student groups and the media about sustainability and green technology. Mr. Newman is Owner/Managing Partner of Newman Consulting Group headquartered in Bloomfield Hills, MI. He is a Certified Energy Manager (CEM), Certified Sustainable Development Professional (CSDP), LEED Accredited Professional for Building Design and Construction (LEED AP BD&C), ASHRAE Distinguished Lecturer, Operations and Performance Management Professional (OPMP), Building Energy Assessment Professional (BEAP) and Fellow of the Engineering Society of Detroit (FESD). He can be reached at 248-626-4910; email jimn@newmanconsultinggroup.us. Architects, Engineers and Designers, click here. Building Owners, Developers, Facility and Maintenance Managers, click here. Optimized Building Solutions and PACE (Property Assessed Clean Energy), click here.